Robinia Hardwood which also called black locust wood is a very popular & durable hardwood floor material used in Aisa & South American Regions. Robinia wood in the market of China is called Chinese teakl, the name of "Teak" is over praised as the wood has no relationship with True Teak(Tectona Grandis),but the wood in hardness & durability is good enough to be milled as hardwood flooring and with a life span over 25 years under proper maintenance. 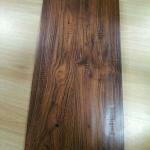 The reason why robinia is called "chinese teak", all because of its golden color after perfinished. 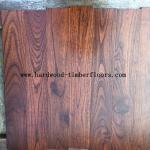 Clear grade robinia looks exactly to true prefinished teak solid wood despite its high density. In general,Robinia hardwood is as good as small leaf acacia hardwood in quality.Common grade robinia wood is knotty,which is an ideal material processed as distressed & handscraped flooring. AB/ABC Grade robinia wood is usually to be treated as hand scraped hardwood floors with many stains like Grey,Yellow,Brown,Black etc . 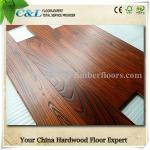 C&L HARDWOOD robinia flooring starts from price 2.9USD/S.Q.F,big volume buyer will enjoy more discount!